If the service is free, then it is quite possible that many people are interested in it. Not only people who really want to create their own website, but also malicious users who want to take advantage of the fact that the service is free to use it for sending spam, distributing illegal software, scripts for flood and DDoS attacks, among others. For this reason, easily one service user can make the server that supports the same unstable and cause all sites to be inaccessible and may cause long downtimes without you can claim it is actually a service whereby non-paid. The downtime will cause your site, be it a business, project or portfolio and thus can “cost” more than what you thought. Again, being a free service, this will be “invaded” by any person. The more users of the service will make it more difficult to maintain server stability. When there is some downtime, probably your first thought will be to send an e-mail to customer support department to ask, what’s the reason for the downtime? Yours and the other users hosted on the same service. You should understand, being a free service, unless it is supported by a large company with many employees and a dedicated team to the free service, it is very likely that this is a work of a single man, in his spare time, probably not since the hosting service will be free that ensures your salary at the end of the month, unless it is monetized with advertising on your sites. Given this detail, your support requests may take days, weeks or even months to be answered. In addition, the person who is providing support will not bother to help you solve minor issues that are easily resolved and which are platform related that your site uses. Usually, only a few companies who cherish professional hosting by better tracking their clients care to help in such kind of issues. Many of these services are supported by revenue generated via advertising on the customer’s sites. It means the hosting provider will put advertising on your website forcefully, and you have to accept it if you want to continue with the free hosting service. There isn’t any issue if the service provider puts advertising on your personal website, discussion forum or other community, however, it doesn’t apply to websites such as online stores, promoting products and services or institutional sites. For example, if the Google Adsense system is used to for advertising, then it will show ads related to the content of your website. In the same way, if your site is an institutional or business, then obviously it is going to show ads of your competitors on your website which is not very pleasant for the credibility of your business. Another major disadvantage of these free web hosting services is that most of the service providers won’t allow you to have your own domain, being forced to use a sub-domain name service, such as “yourdomain.000webhost.com”. Besides being a name quite long and difficult to remember, your customers and users of your site will start to be aware that you are using a free service. For many people, the image that will convey is that your online business is not relevant, which may cause you to lose business, proving once again that “cheap is expensive”. With a professional and premium hosting service, you can have your site with a domain name itself, and may even change your web hosting company at any time without having to change the site address. Many of these services do not provide e-mail accounts, making it impossible for you to create an e-mail account with the address of your website. Even those who provide services, your e-mail will be something like yourname@yourdomain.000webhost.com. Probably it will not be interested in putting this address in their contact cards and will end up using a e-mail: @yahoo.com, @gmail.com @live.com. If you compare these, still it continues to be a free service and without any branding for your company, it’s not worth. With a professional hosting service, you can create your own mailbox with the address of your site, for example: yourname@yourdomain.com. Most of these free web hosting providers only provide support to HTML pages, making it impossible to create dynamic pages with links to database and forms. Support for PHP and MySQL is very simple to be implemented on a server; however these technologies greatly increase resource consumption by each hosting account on the server and thus drastically reduce the number of hosting accounts for a normal server. Usually hosting companies define a maximum value of hosting accounts per server for on average 250 accounts / server. However these services tripled this value on servers with PHP and MySQL support and servers without support for these technologies may increase to 2,000 to 3,000 sites per server, since HTML does not use any server resources to compile its syntax, unlike what happens with PHP-based sites. With only HTML support, your site will be very sluggish and will not have much interactivity with the customer, making it a site with only static content with almost no features. Although some hosting providers also offer Free Web Hosting Plans with Unlimited Space and Unlimited Bandwidth , most of them excessively limit the disk space of their plans by not providing sufficient disk space and monthly bandwidth so you can maintain your site. Typically a hosting plan of a joint account, which occupies more disk space, is sometimes not the files of the site, but the mailboxes of their e-mail and databases of their websites. If you reach your limit of space, probably the free hosting provider will get your site down and won’t be up until you upgrade your hosting plan to a paid service. This will make you to quickly find a hosting service to migrate, which is a process that should normally be done with some care, a lot of research and time. The same happens in the case of achieving monthly bandwidth of your site, requiring an immediate migration service. 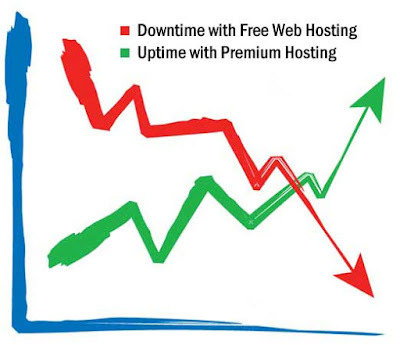 Sometimes some free web hosting providers do not activate the plan after exceeding monthly bandwidth, putting the “Terms of Service – ToS” indication of fees if it exceeds the monthly traffic, and these values usually are exorbitant and the service can be more expensive than a normal service if no attention is paid to consumption. You cannot expect the latest and most useful tools in a free hosting service. Usually this type of services used control panels that are limited in terms of features, which make the simplest task, authentic puzzles. Most services won’t allow you to create even a backup file for download, and this process has to be done manually using FTP, if FTP details are provided by the service provider. It can also be limited to a file manager, web-based. If you like tools that allow you to install hundreds of scripts on your hosting account with just a few clicks such as Softaculous, then it’s better to opt for a premium hosting service that offers such tools. Think about Idera CDP Backups (formerly known as R1Soft CDP Backups) is the solution for server backups more than a spectacular hosting service you may have. These are just some of the examples of features and tools that are usually not available with a free web hosting service. Unfortunately, nowadays almost everything has a price; however the data and information is something that can hardly be assigned a value. A simple database can contain very important information and is worth millions of Dollars ($). In any hosting service, whether free or paid, the customer is responsible for maintaining the security of their copies, unless you pay extremely high values for a service that guarantees the integrity of your data backups. Whenever the client wishes to make a change, maintain or update the platforms of their site, they should create a backup and download the same to their computer, double the same for server testing / developing local or remote and only after confirming that the changes were applied correctly in test environment / development, that should make uploading to the server where the platform is in production. The customer should not be waiting for the backups made by the company for the recovery if an update goes wrong. However the truth is that most professional hosting companies provide backups if the client requests, if it has made any changes that have gone wrong. However, the client will not have the same fate in a free hosting service, because most likely there will not be a plan for backups, even for recovery in case of hardware failure. Thus, if there is a hardware failure and you have not done your backups, you can say goodbye to your site and probably your online business. As everyone knows, cheap is expensive. A service for which no amount is paid doesn’t even have the invoice or receipt that you are being supplied, is a kind of service where you cannot expect guarantees or cannot complain or demand for any value added service. It would not be the first time one of these services disappeared from the Internet from one day to the other, leaving thousands of inaccessible sites and causing damage to thousands of businesses. There are many reasons why this can happen, whether the service has become untenable for those who were to bear or even total loss of data that had been planned without any strategic plan for data recovery. Keeping a commercial site in one of these services is not worth, as you never know that if your site will be online tomorrow or simply disappeared.